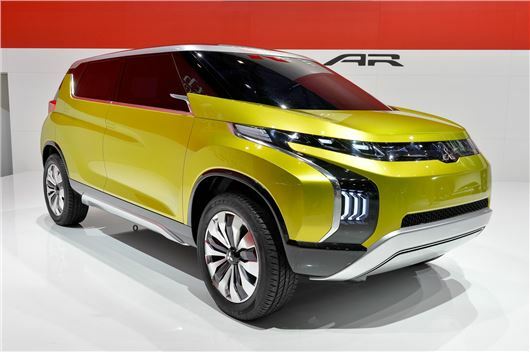 Mitsubishi’s Concept AR has been launched at the Geneva Motor Show. The hybrid MPV hybrid features front-wheel drive and a turbocharged three-cylinder 1.1-litre petrol engine, mated to a 120kW motor and a 48V lithium-ion battery. Mitsubishi has remained absent from the MPV market since axing the Grandis in 2011 and it is understood that the manufacturer is intending to introduce the AR in Japan, before exploring other markets in Europe. The concept uses the same hybrid technology as the XR-PHEV, with a small petrol engine mated to a powerful electric motor. Mitsubishi claims the lithium-ion will not impact the car’s load space, with it situated beneath the boot floor. Visually the concept is impressive, with clean cut lines and 3D-sculptured wheelarches. Measuring 4350mm, the AR is similar in size to Volkswagen’s Touran and features four or six seats, depending on specification. The concept also has a generous amount of safety kit too, with forward collision mitigation braking, blind spot warning and adaptive cruise control. No sale dates for the AR have been confirmed, but Mitsubishi has told us it will make global production and form part of an all-new line up for 2020.